There’s plenty of buzz in Minnesota’s political circles today about former Republican Gov. Arne Carlson endorsing Barack Obama. But the move isn’t terribly surprising. Carlson is a more traditional East Coast Republican — a Williams College educated intellectual with an appreciation of both social service and fiscal conservatism — a progressive Republican. That’s the kind of Republican the party purged in the ’90s. Carlson was a thorn in the side of the party, even when he was its highest-ranking official as governor, so the endorsement is unlikely to sway many — if any — Republicans. During his term, the party consistently endorsed more conservative candidates for governor. Carlson usually ignored them, then beat them handily in the party primaries. Carlson was the first Republican governor in the state’s history to be denied the endorsement by his own party. Alan Quist lost in a landslide to Carlson in 1994 after running a campaign based on moral issues — Carlson supported legalized abortion — but that was back before that became the party mainstay, and when Republicans in the state were known as Independent Republicans. 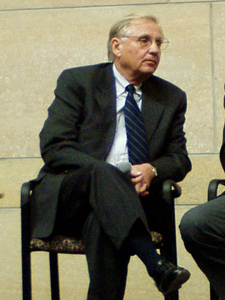 Since leaving office, Carlson has teamed up with former VP Walter Mondale to try to repeal the concealed carry handgun law in the state, criticized Gov. Tim Pawlenty’s budget plan to use money from the Health Care Access fund, which funds the state health insurance program, and went to the Legislature to lobby against Pawlenty’s cuts in a state program to curb fetal alcohol syndrome, which was his wife’s project. He’s also endorsed the occasional Democrat in state Legislature races, as he did in 2004 in DFLer Jim Carlson unsuccessful bid in District 38B, and he endorsed DFLer Rebecca Otto in her successful campaign for state auditor in 2006. And earlier in this campaign, the Washington Post published a letter from Carlson lamenting that religion was being used in the Republican Party as a litmus test for the vice presidential selection. For more than a decade, Arne Carlson has had nothing in common with the Republican Party. Today was no exception. are all in this together. repeated moments like these make me wonder why someone like Arne Carlson keep their Republican affiliation. If they have nothing (much) in common with the current Republican brand, why not change party? Do they hope to revive the “old” Republican brand? Seems to me like a lost cause if people such as Bachmann are the party’s up-and-comers. They don’t change parties for the same reason middle of the road Democrats don’t change parties, they want to bring their party back to the middle. Political party insiders are always fighting for the souls of the faithful. But one of the problems is the either-or mentality of party insiders of both parties. They think the logical alternative to an extreme position of one party, is an extreme position of the other. And that’s not really true. Middle of the road Republicans and Democrats think the opposite of the extreme end of an individual party is the middle of the entire political spectrum. That neither party really understands that is why so many people are frustrated with the party insiders. Bob, I agree with everything you said in your last post. I guess the main point I was trying to make is that I have serious doubts that the Republican brand will become more moderate any time soon. At least, I don’t think it’s likely to happen in Carlson’s lifetime. I admire individuals like Carlson who fight to refocus his/her party, but at the same time it must feel like a losing battle. //I admire individuals like Carlson who fight to refocus his/her party, but at the same time it must feel like a losing battle. Another MN politician whose personal politics were well “left” of his party was Wellstone. I imagine he went through many of the same frustrations dealing with “party insiders” Democrats as Carlson did with insider Republicans. I think it’s a generational thing. My completely anecdotal (by in-laws) suspicion is the old-style Republican is much older and unable to marshall any organization to begin dragging it back to the middle. Some, I think, have gone off to the Independence Party, but not that many. Some have also joined the Democratic Party but run as former Republicans to appeal both to Dems and to disaffected Republicans, but they can’t get any love within the party establishment. One interesting character in Minnesota on the other end is Rep. Collin Peterson, who is a very conservative Democrat. When I hear DFL state chairs and other officials give shout-outs to the Minnesota congressional delegation, I never — and I mean NEVER — have heard the name of Collin Peterson. So just as there’s little love or respect for the middle of the road Republican in the Republican Party, there’s not that much for the conservative Democrat in the DFL either. The Republicans are going to need leaders like Gov Carlson to rebuild their party after this election. It really IS time for Republicans to return to the middle. Thank you Governor Carlson for your efforts and for your endorsement. I am one who lost my party about 15 years ago.